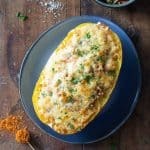 This chickpea stuffed spaghetti squash recipe can be prepared in only 20 minutes!!! Stuff it with chickpeas and mega healthy broccoli coleslaw, season with Cajun spice, top with delicious melty cheese and pop under the broiler. PERFECTION on the dinner table! 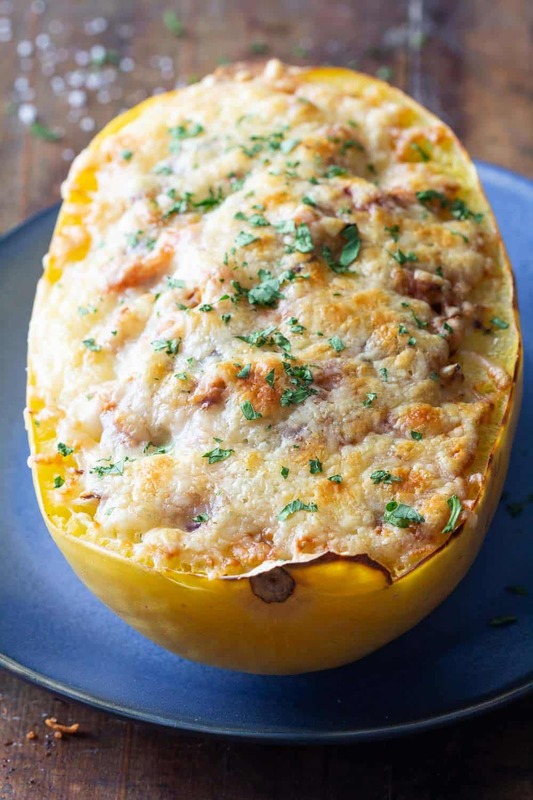 A veggie loaded stuffed spaghetti squash recipe that will make it into your “super yummy healthy recipes binder”. Let’s get right into the details. #1 Pressure cook: Wash your spaghetti squash, cut it in half lengthwise, remove its seeds with a spoon and season with a little sea salt. Add a trivet to your pressure cooker, add 1 US metric cup of water to the bottom and then place the squash halves cut side up on the trivet. Make sure the sealing ring is placed correctly. Close the lid. Turn the knob to sealing and pressure cook on high pressure for 8-10 minutes depending on its size. I used a 2.2 lbs squash and 2-3 lbs squashes should all cook in 8-ish minutes. If you use a 4 lbs or bigger squash add 1-2 minutes. Quick release the squash and tadaaaa ready! I wait a couple minutes for the handles of the trivet to be cold enough so I can touch them and that way it’s easy to pull out the squash halves. #2 Roast in the oven: Wash your squash, cut it in half horizontally, remove its seeds and season with a little sea salt. Preheat oven to 400F (200C) and place squash halves cut-side down on a baking sheet. Once the oven is hot, roast for 40-60 minutes depending on the squash’s size. Use a fork to insert and find out after 40 minutes. It should easily slide in. Remove from the oven when it’s soft and tadaaa ready! 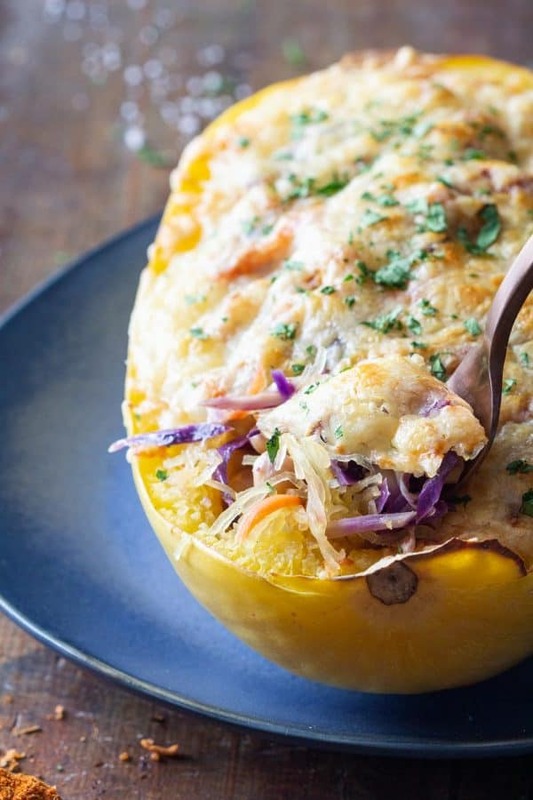 Spaghetti squash has a very very mild taste so you want to stuff it with a very flavorful filling. Use tons of delicious spices or keep it simple with a spice mix like “cajun seasoning” and season your chickpeas (or make it a chicken spaghetti squash if you prefer) and broccoli coleslaw and stir fry a little until super fragrant. The cajun seasoning is really the hit in this recipe, it tastes so incredible on the chickpeas and topping it all off with your favorite melty cheese makes it an absolute delicacy! A 20-minute chickpea stuffed spaghetti squash recipe with mega healthy broccoli coleslaw, tons of Cajun spice and delicious melty cheese. Halve spaghetti squash lengthwise, deseed and cook in the pressure cooker or roast it in the oven as instructed in the blog post above. Preheat a large pan over medium heat and once hot add a drizzle of oil, chickpeas, broccoli slaw and then season with cajun seasoning, sea salt, and pepper and stir fry until fragrant and veggies are slightly soft. 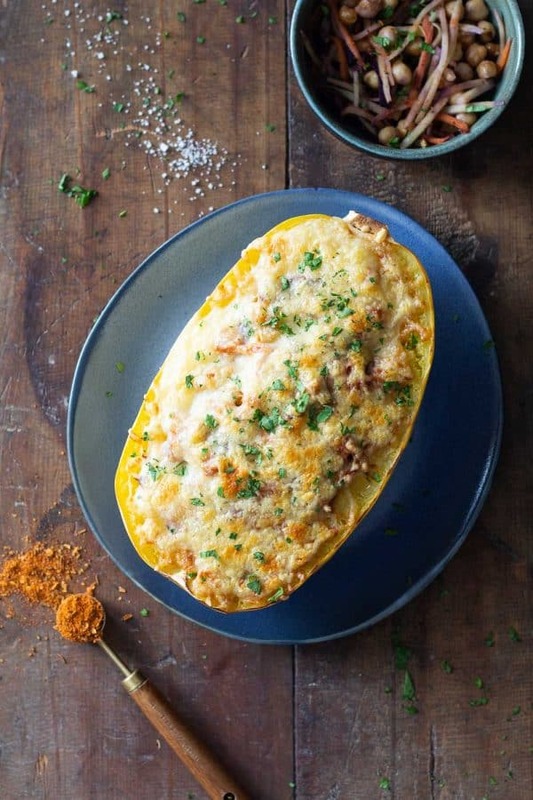 Place halved spaghetti squash on a baking sheet or oven-proof dish, stuff with the chickpea-slaw mix, top with grated cheese and put under the broiler until all cheese melts and starts browning. This looks tasty! 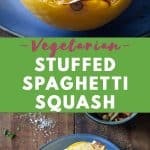 Do you “fluff” the squash before adding in the other veggies? Thanks. No, I don’t, I just scrape it out while I eat it but you could certainly fluff it before adding the filling.